The tour starts only at lobby of your hotel and you'll be in a small-group to see the best attractions in Acapulco. You'll visit the chapel of peace, the high cliff divers of La Quebrada, the working class housing sectors, the rich residential area, the middle class neighborhoods, three different stops for pictures, the mural of Diego Rivera. Your tour includes drinks, transport and a professional guide. The tour starts right at the lobby of your hotel in between 10am and and 10:45am depending of the location of your hotel. When you are on board you'll go directly to visit the highest attraction in Acapulco, The Chapel of Peace, located at the very pricey and exclusive "Las Brisas" residential area located right on top of the East mountains of Acapulco. When visiting the famous Chapel of Peace and the Trouyet cross perched atop the East Mountains of the bay in the heart of the exclusive and very pricey Las Brisas residential area; once at the Chapel of Peace you will enjoy a guided visit by this iconic place at the highest part of observation to the bay. 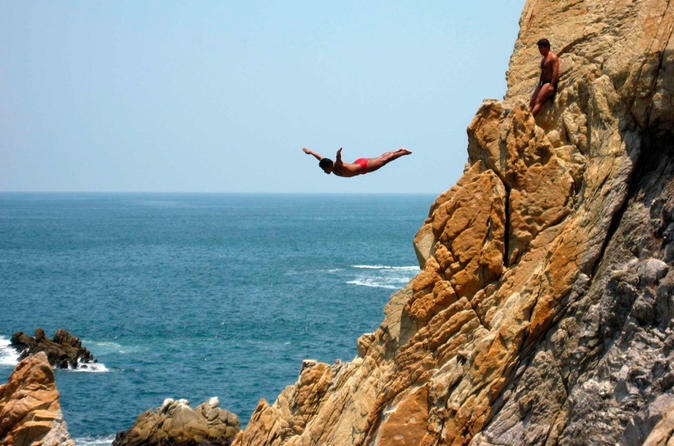 If you come to Acapulco and you don´t see the diver you have not been to Acapulco. We will then head West to see the Diving Exhibition at 13:00. The admission fee is included in your tour. After we have seen the show we will take you to see "Casa de los Vientos" once owned by Diego Rivera (most important plastic artist of Mexico and Dolores Olmedo, the famous art collector and Rivera´s muse. After being explain in full about this, one of the four last works of the "Divine" Diego Rivera, we will head west of Acapulco and to see the traditional "Viejo Acapulco", You will also stop west of the city for another great picture stop at the Del Monte Hotel. Lastly we will head back to the hotel where the tour started or we can let you off in any place you wish along the way. End of our Services.